You’ve brought your adorable puppy home and you’re wondering how difficult it’s going to be to house train him or her. 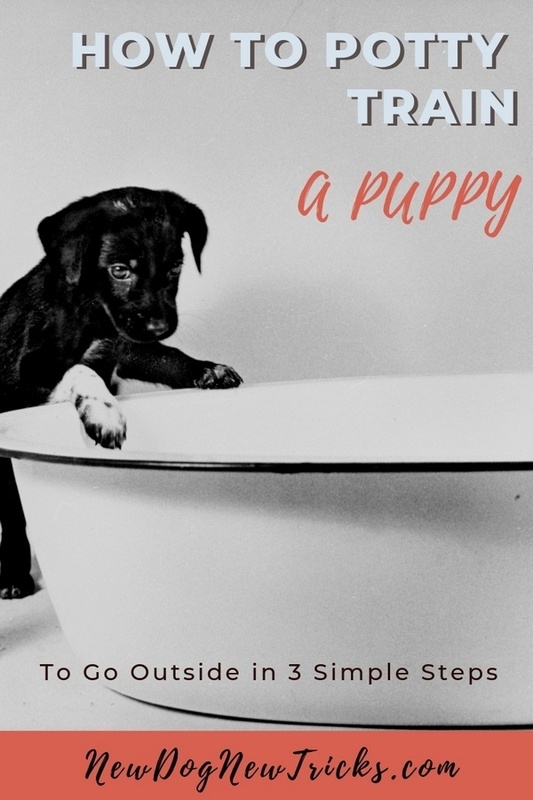 Read on to find out how to potty train a puppy to go outside. You can potty train a puppy to go outside in 3 easy steps. If you follow these three steps, you should be able to house train your puppy in no time at all. It should take you no more than 2 weeks to know that your puppy is fully house trained. Note that before you learn how to potty train a puppy to go outside, these steps work better if your puppy is crate trained first. For the first two or three days, take your puppy outside to the same spot every hour and wait for him to relieve himself. Don’t move from that spot and don’t walk him. Let him have the length of his four-to-six foot lead. Praise him profusely as soon as he goes, and give him a few pieces of his puppy food. Make sure to pet, and hug him too, and reward him with a walk around the block. After his walk, allow him a supervised run of the house for 20 minutes. Then put him into his house training crate for 35 minutes. If you’ve waited outside for more than 20 minutes, and your puppy hasn’t relieved himself, bring him back into the house and put him into his crate for 20 minutes (just to assure that he doesn’t relieve himself in your house), then take him outside again. Repeat this process until he relieves himself outside. Make sure to take him out just before you go to bed. You’ll also want to take him out once or twice during the night without taking him for a walk or letting him run around the house. You may lose some sleep now, but it will save you many sleepless nights in the future. During the next week, take your puppy out once every 90 minutes during the day and as needed in the middle of the night. He’ll let you know when he needs to go. During the day, if he relieves himself outside, give him 30 minutes of supervised run and play time. If he doesn’t relieve himself, again put him back into his crate for 35 minutes. Always supervise his indoor activities, and don’t give him an opportunity to fail. Gradually add time to his supervised run and crate time until he’s successfully holding it for three hours during free run time, and four daytime hours in the crate. Don’t forget to take your puppy outside immediately after he leaves his crate to avoid accidents inside your house. The final phase of learning how to potty train a puppy to go outside is the easiest one. You are just ensuring your puppy doesn’t fall back into bad habits. Within about 10 days, your puppy should have a good understanding of what’s expected of him. But you shouldn’t stop your training efforts. If you catch your puppy sniffing around the house and squatting, shout “outside!” and take him outside immediately. Praise him outside as he finishes up. It is vital that you continue to watch him closely during his indoor free run time, so that you can catch him in the act if he has a bit more to eliminate. Now you know how to potty train a puppy to go outside, you can start following the 3 steps. 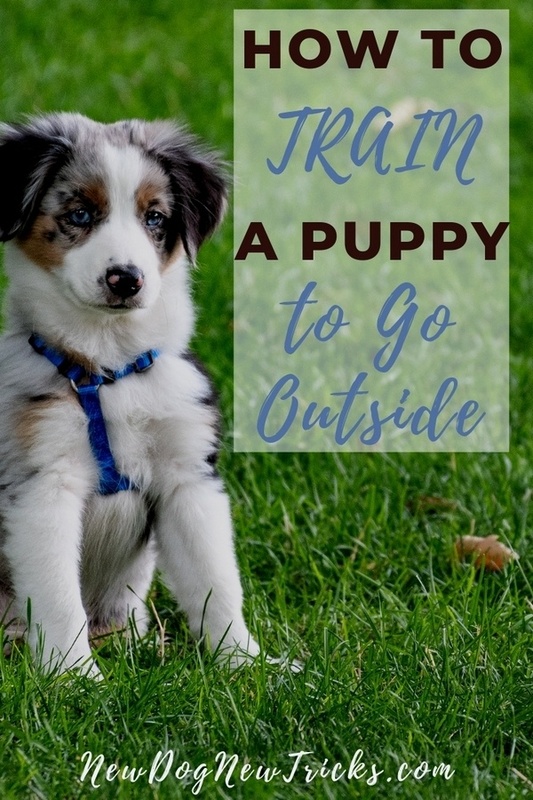 It will take a little bit of work at the beginning to house train your puppy but use these 3 steps and you’ll find it’s worth it in the long run. 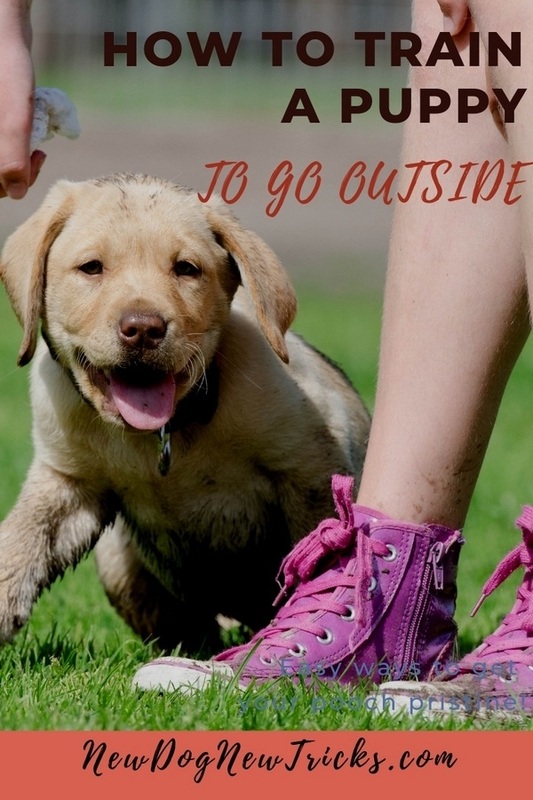 Post this How to Potty Train a Puppy to Go Outside article to your favourite Pinterest board! Types of Dog Food – Which One should You Choose? Dog Beds for Large Dogs – Which Are the Best Dog Beds?